Maps: Randomly generated maps, preferably island with many hiding spots. Number of worms: 5 worms for each player for 1vs1. Each worm has his own unique weapons, abilities and roles. With included rubberworm functions: SWAT (switching worms at any time) and LDET (loss of control doesn't end turn), player can control any worm at any time during his turn. Each player can do exactly two attacks (not counting utilities). 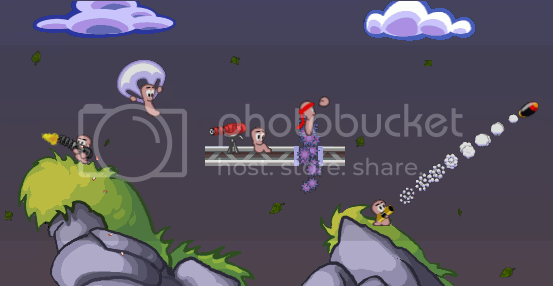 Worms are heavily encouraged to cooperate with each other, trying out different weapon combinations. Worms are placed on the map manually, each worm choosing best territory for his specialization. Jack of all trades, Soldier excels at many roles: attacking, defense, long range suppression, he knows it all. Soldier has largest health pool and cannot be killed off in one turn with direct damage. His weapons can do up to 90 damage. Beware that he has a high potential for self damage. Soldier has longest effective range, though his weapons become unreliable at longer ranges. Both Bazooka and Grenade have arcing trajectories, so they can be shot without line of sight and be used to deactivate enemy Sentry Guns. However both his weapons can be almost fully denied by an Electromagnet. Bazooka and Grenade are explosive, so they can do splash damage and hurt multiple enemies clumped together. (Medic and his patients for example). Soldier's weapons do considerable damage to terrain. In desperate situations Soldier can use one of his weapons for advanced mobility at the cost of his health. Soldier is the main combat worm and a good Medic buddy. Placed first on the map, Soldier is used to capture and secure advantageous positions, determine the placement of future stronghold. Usually placed near the top of the map, where he can cover most ground. Can work solo in the enemy territory as a big roadblock. Glass canon of the team. Deals huge damage, but cannot sustain as much punishment as a Soldier. Can be used as a shock troop. His main gun is a big and scary Gatling Gun. It deals monstrous 90 damage at point blank in one fell swoop, but it's effectiveness quickly deteriorates with range. Gatling Gun requires line of sight so it's less suitable for dealing with Sentry Guns. With some practice and favorable positioning, it is possible to throw worms over long distances by repeatedly shooting them in mid air. Another interesting trait of the Gatling Gun is it's abundance of bullets, which enable efficient digging through soil. Prod can be used to push worms into obstructions for a full damage from Gatling Gun, piling worms together, or pushing careless enemies into environmental hazards. Gunner is placed second, so his roles can vary: supporting friendly Soldier, protecting weaker worms, trying to threaten enemy Soldier, denying good placement for enemy headquarters. Thanks to his digging abilities, Gunner can be safely placed underground as a reserve troop, or can be used to support other worms by creating new paths for them. He has many tools at his disposal. Blowtorch improves infrastructure, allows to open paths for assault. It can also be used as a melee weapon to damage and push enemies. Only weapon which doesn't have delay. Girder has shorter range than usual, so it can only be placed nearby. It can be used to build bridges and ramps, or to block dangerous paths from enemies. In desperate times Girder can block enemy worms directly. It can be used every second turn (delay of 2). Friendly Mine: Useful for blocking paths from enemies (Friendly Mines explode sooner than regular mines and are not triggered by teammates). Coupled with Gravity Gun, Mine can be used as a makeshift grenade launcher. Has a delay of 2. Sentry Gun: Main base defender. Can cause up to 40 damage to attackers and delay their advance. Useful for fending off Ninjas. It can be used offensively to amplify attack damage and restrict enemy movements. New Sentry Gun can be placed every five turns. Electromagnet: Protects against ranged spam attacks from Soldiers and other Engineers (with mine launchers). Magnet's polarity can be reversed. When placed near enemies, reversed magnets can ease ranged shots or attract terrain mines. Has delay of 8. Gravity gun: Useful for relocating Engineer's buildings (Friendly Mines, Sentries, Electromagnets) or quickly tossing them in hard to reach spots. Gravity gun can use any mines as projectiles. It can also be used to slightly improve jumping. Engineer is mainly a support worm. Since he doesn't have any reliable direct damage weapons, he relies on teammates and his gadgets to protect him. Fully set up base can be very hard to infiltrate. Good for protecting Medic and wounded teammates. Placed third. His role is to set up a base, which would protect and support teammates. Engineer should be placed in safe spot, usually underground, but offensive engineers are not uncommon. Sentry + Mine combo can be devastating but Engineer cannot sustain dishing out this much damage, since nearly all his weapons have delays. Also note that worms placed before Engineer are heavier classes, so ambushing them is very risky. Try to predict where the lighter worms will be placed next and deny their good spots. Fast attacker. His weapons are weak, but his mobility is best, bar none. He can quickly get in, do his dirty job and get out. With his Fire Punch he can finish off wounded enemies, punch them into environmental hazards or less beneficial positions. Ninja can also throw enemies towards his teammates, who could finish the job. Petrol Bomb can be used either to block enemy movement, or to further push enemies around. Petrol bomb can be used for damage, though it's tricky. Petrol Bomb has a delay of 3 turns (duration of burning). Jump does not count toward turn limit usage, so Ninja can use it at his leisure for supreme mobility. However careless jumping can damage the Ninja and with his tiny health pool, it won't take much to kill him. With some effort, Ninja can tackle and knock other worms around, using Jump, at the expense of his health and safety. Ninja is a fun worm who can exploit some unexpected attack angles. If things get bad, he can be used as a defensive worm to protect the base with his flames. Ninja is a squishy worm with smallest health, so place him very carefully. One of the good spots would be to put him near Engineer - Medic combo to ensure his survival till opportunity arises for him to shine. Another common spot for Ninja is a hard to reach edge of the map from where he can plan his next attack. Last, but definitely not least is the Medic. As the name implies his job is to heal worms. At the beginning of every turn, every friendly wounded worm inside Medic's aura will be healed for 10 hp. Medic himself however cannot regain health in any way. This means that he should be protected from incoming damage (by Magnets and Sentries). Medic has a Shotgun, boring but practical. Decent for self defense, can serve as additional firepower and a humble digging tool, for when no better alternatives are available. Parachute is useful for slight advanced mobility, helpful for reaching his patients (or enemies). Parachute also protects Medic's precious health if he can't afford to lose it when falling down. Placed last, Medic is arguably most important worm of his team. He can be a game changing worm, able to pull the odds back to favorable, even after an unsuccessful attack. That's why Medic will be a prime target for Ninjas (or other offensive worms who happen to be nearby). So never leave him out in the open. It's wise to put him near teammates, who will kill off any incoming attackers. Engineers make good Medic protectors, able to counter both Ninjas (with Sentries) and ranged explosive spam (with Magnets) and blocking all entrances with Mines and Girders. Do not forget to use SWAT to your advantage and use worms simultaneously. Combining attacks from multiple worms, stacking worms on top of each other to reach high places without spending turn, switching from mortally injured worm to a healthy one to retain a turn, gathering wounded worms around the Medic, those are only few examples of this powerful utility. It might not be real time but it's pretty close. Every worm has his strengths and limitations, so while experimenting and looking for new roles is fun, try not to overextend your worms and get them killed. Gravity Gun requires Pyroman's libs! Last edited by DumbBongChow on Thu Jul 03, 2014 6:59 pm, edited 1 time in total. Oh. This is a official version. There's already other mod-versions being hosted at Wormnet, but I highly recommend watching the attached replay for anyone interested in this scheme to see how game plays out at a competitive level without all the extra weapons. interesting idea... i believe reinstall wa: to try it. This sounds really cool!! But the replay doesn't work. Could you maybe post a video I really wanna try this and see what it's like but I don't have internet at home right now. This is a great scheme DCB, ive played it lots. “If you can't explain it simply, you don't understand it well enough” - Albert Einstein. I recorded a video of the replay in the 1st post for anyone who has trouble viewing it. I'm kind of wondering, if anyone knows how wosc lib in the zip handles 'personal invisibility'. I'm currently having troubles with giant team colored arrow rendering above the invisible worm at the beginning of turn. Everything else has it's own render function, but this arrow does not. Hey, DumbBongChow, how about the Spy class. The Spy class is an offense-support class for confusing his enemies and destroying their Engineer's/Gunner's Bulidings with his trademark utility, the Electro-Sapper. He can use the following weapons: Invinsibility (aka Cloak), Disguise Kit (can disguise into an Enemy Worm, (preventing the selected enemy's Sentry Guns from detecting his presense unti he attacks an enemy worm), a Mine, (can be used to annoy the enemies and block them from reaching key worms of his team, like Ninja, Engineer or Medic), or a Crate (can be used to trick opponents into entering dangerous zones), Backstab Knife (deals 25% damage from behind and 5 damage otherwise) and the Electro-Sapper (disables and slowly destroys enemy buildings). His HP is 125. He can cloak, backstab and disguise without delay, but his Electro-Sapper can be only used every 2nd turn.